James Stanworth was born at Burnley, in 1870, and died in Blackburn, in 1941. Both his parents died when he was very young, and he remembered neither father nor mother. He was one of a family of five sisters and two brothers, and he was “brought up” by his sisters. As a boy he was sent to a public elementary school, and later he supplemented his education by attending evening classes at the Mechanic’s Institute. When old enough to work he entered the services of Messrs. Duckett and Sons, Sanitary Pipe Works, Burnley, with whom he received excellent business training. At 21 years of age Mr. Stanworth married, and at 23 he had the offer of becoming the London representative of the firm of Messrs. Duckett and Son, of becoming the manager of his uncle’s brick works at Nelson, or taking over a small business of an umbrella manufacturer. He chose what his friends considered the worst proposition, namely the umbrella business, but by hard work and long hours he built up a large and prosperous concern. One small shop was all he had at the beginning; J. Stanworth and Co. had fourteen branches spread over Lancashire, and had about 100 employees. It was in March, 1900, that he opened out in Blackburn, starting in one portion in Darwen street, later removing his works to the old Venetian Hall, near to the General Post Office, which were converted into model workrooms; just as his shops were among the most up to date business premises in this or any other town. By hard work, paying close attention to business, moving with the times, regular and extensive advertising, Mr. Stanworth built up a large and successful business, and had become known throughout this country and in lands overseas. It is not generally known, but Messrs. J. Stanworth and Co. probably did one of the largest parcel post trades of any business firm in town. The Mayor-Designate was something more than a successful business man; he stood for the highest form of citizenship. Not without misgiving did he accept the presidency of the Tradesmen’s Association (now known as the Chamber of Trade), in 1912, a position he held for two years. Until he was placed in that office he had never made a speech in public. He put new life into the association, and by earnest advocacy of high ideals stimulated others to take the same pride that he has in making Blackburn the shopping centre of East Lancashire. For twelve years, side by side with the promotion of his business interests, Mr. Stanworth had rendered signal service to the community by ungrudging work in many spheres. His acceptance of the presidency of the Tradesmen’s Association led to his appointment to the Chamber of Commerce, of which he became the chairman, in March, 1918. He held that office for three years. Next, he was elected to the town Council. 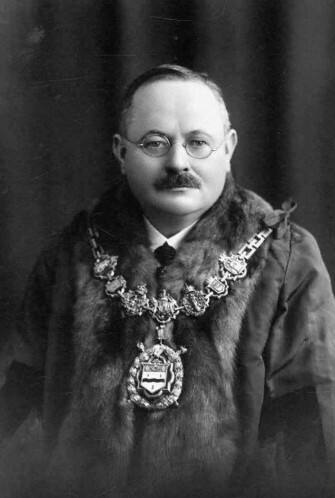 After one unsuccessful attempt by a bi-election in St. Matthew’s ward, in May, 1919, he was returned for St. Mary’s Ward in November, 1920, his Labour opponent on that occasion being the late Mr. Austin Harkin. Though nominated by the Liberals, Mr. Stanworth was supported by the Conservatives, who showed their satisfaction at being represented by a business man of his type by allowing him an unopposed return last November. Councillor Stanworth is on most of the important committees of the Town Council, including the Education Committee and its two sub-committees, representing the elementary and secondary sides. He is acting Vice-chairman of the Electricity Committee. In April, 1917, he was placed on the Commission of the Peace for the Borough. During WW1 he was a member of the Advisory Committee of the Military Tribunal, and Chairman of the War Economy Committee, and of the War Savings Committee. In connection with his work on the War Saving Committee, mention should be made of the two and a half million pounds raised in Blackburn for the Victory War Loan. Mr. Stanworth took prominent part in this great achievement. He was a vice president of the National Chamber of Trade, with a seat on the Executive and Parliamentary Committees; a vice president of the Blackburn Chamber of Commerce; a member of the Executive of the Blackburn Liberal Association; a member of the Board of Honorary Trustees and Managers of the Blackburn Savings Bank; and elder of St. George’s Presbyterian Church, president of the Blackburn Chess Club, president of the Amateur Orchestral Society, president of the Blackburn Sunday School Football League, president of the East Lancashire Motor Cycling Club, and chairman of the Commercial Department of the Technical College. Long though this list is, it by no means exhausts the catalogue of offices the Mayor-Designate now holds or has held. He has a keen appreciation of music and art, and is fond of golf and motoring. He is a Freemason. Initiated in Fidelity Lodge No. 269, in May, 1916, of which he is still a member, he subsequently joined the daughter lodge of Manor No. 3322, in which he took office and is now a senior Warden. In Mrs. Stanworth, Blackburn had a Mayoress well qualified for the duties. During the war she was president of the committee dealing with the workshops for unemployed woman, and for several years she was on the Committee of Viewfield Home, and was the treasurer of the Blackburn Women’s Liberal Association. Mrs. Stanworth is a daughter the late Mr. Thomas Howarth, of Oxford road, Burnley, and she was married to Mr. Stanworth at Brunswick United Methodist Church, Burnley, in 1891. They had a family of two daughters and a son, all of whom are talented musicians. The elder daughter, Miss Gertrude Stanworth, was an accomplished pianist. The second was the wife of Dr. Stewart Park, of Huddersfield. She was best remembered as Miss Elsie Stanworth, well known as a contralto vocalist. Mr. Walter Stanworth, M.C., the son, played the violin, and was the hon. Treasure of the Orchestral Society. He was the sub-manager for his father’s large business. Mr. and Mrs. Stanworth had made more than one trip to America, the last occasion being in 1920, when Mr. Stanworth, who was then Chairman of the Chamber of Commerce, attended the Congress of the Chambers of Commerce of the British Empire at Toronto. Subsequently they visited Mr. Stanworth’s only brother, Judge Ward Stanworth, a member of the Supreme Court of Ontario.